We can’t wait to share the results of our hard work with you – the official program for SEETEST 2018 is out! As every year, we strive to invite highly recognized industry specialists, who can really teach us a lot about testing. Because what is life if not a constant learning process! But we also try to be inclusive and give a chance to everyone motivated enough, who has something interesting to say in out session panel. Attendees of the conference will have the pleasure of listening to Erik van Veenendaal and Paul Gerrard give their inspiring keynotes, as well as tutorials on the topics of Requirements Engineering and Digital Test Management respectively. 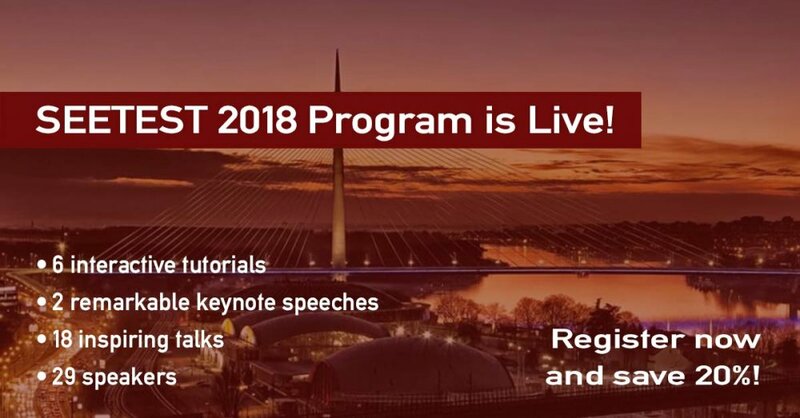 Other tutorials include noted professionals Mette Bruhn Pedersen, who will talk about Typical Challenges when scaling Agile, Olivier Denoo who will be exploring what exactly users want, Vipul Kocher, who will be revealing the Basics of AI and AI in Testing, and Yaron Tsubery, who will lead us through the Basic Practicle Principles of Load and Performance. Some of them will also be giving pre-conference courses – a great way to learn from the best, so sign up for them too! Additionally, we have lined up a whole bunch of great session talks too! Our Program Committee worked long and hard to choose the best entries from our Call for Papers campaign – they are proud with their work and hope that you will be pleasantly surprised too! It all sounds so exciting, doesn’t it? So don’t miss the chance to learn from the best – get a ticket for SEETEST 2018! We are currently into our Early Bird campaign, which is good news, as tickets are 20% off – hurry, so you don’t miss your chance!